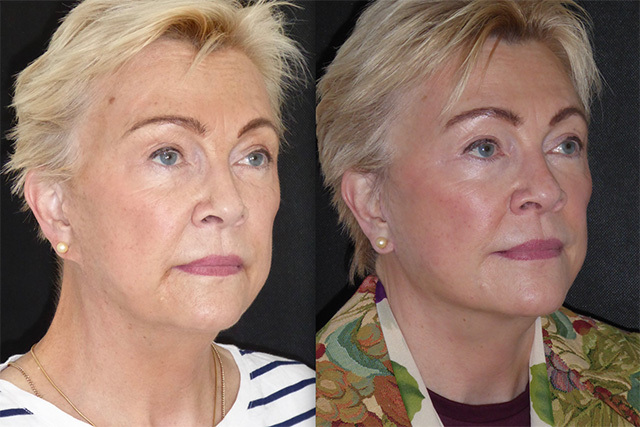 Linda had a facelift a few years before reaching out to me and sought my advice on how to improve the result and repair some of the tension related issues that had resulted. 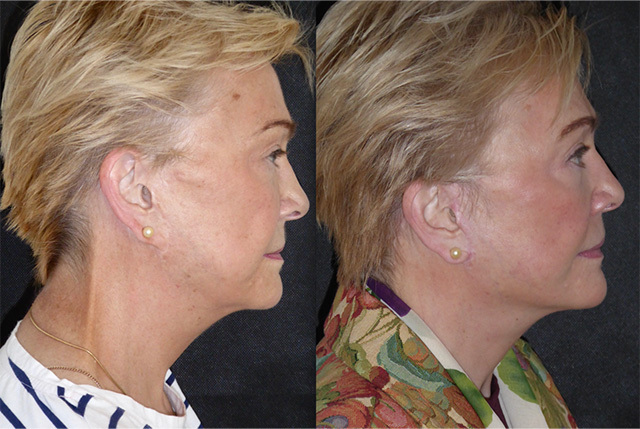 Her previous lift was vectored in such a way that Linda had very little lateral skin reserve, considerable deformity of the earlobes and tragal cartilage, and complete immobility of the area in front of her ear when smiling associated with a deformity called lateral sweep. Her scars were tracked, widened and migrated. 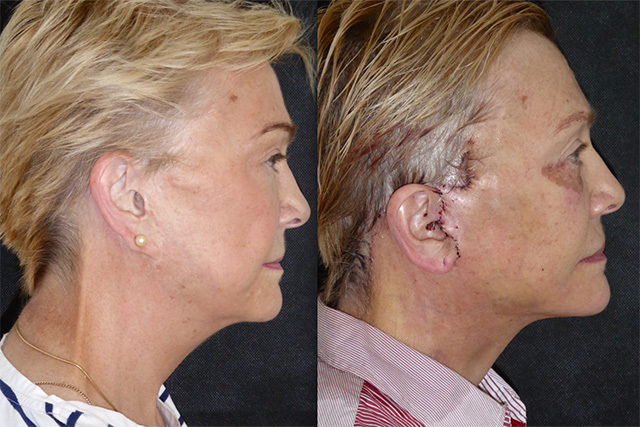 I explained to Linda that revision facial surgery is complex and relies on sufficient tissue reserve to release, revector and repair previous work whilst leaving a tension free closure and to some extent surgery needs to be exploratory in nature. This is approximately 40% of my practice demographic these days so I felt confident that I could get Linda closer to the appearance she was seeking. 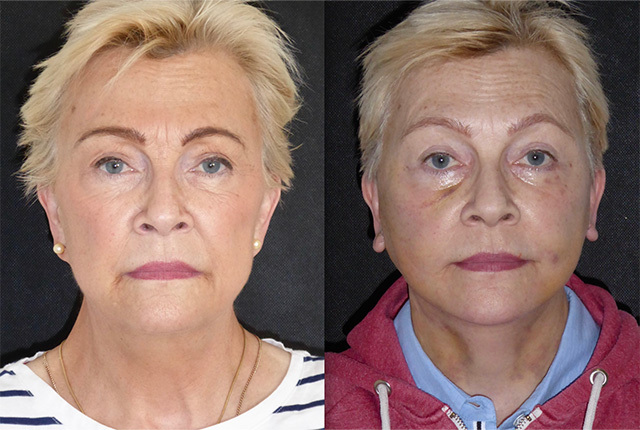 We undertook a revision face and neck lift and I also used the C02 laser to rejuvenated her lower eyelid skin. This is her story. Well that really was tricky! 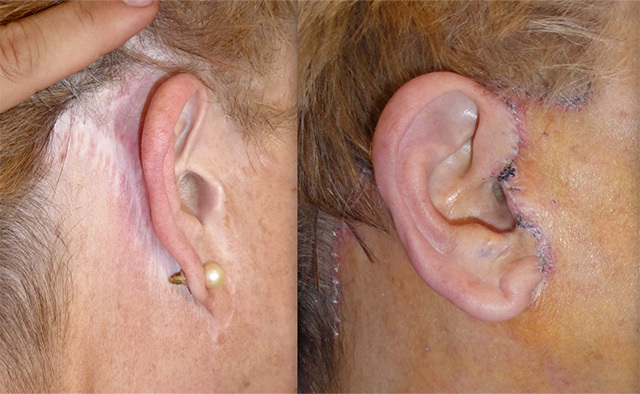 Upon release of the skin there was over and inch of tension laterally which was causing the earlobe distortion and lateral sweep. 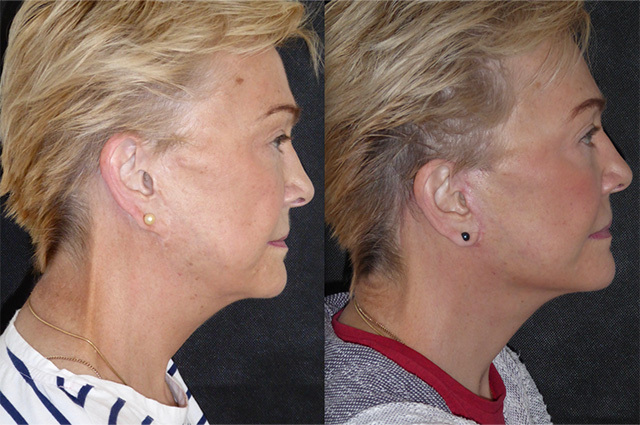 Dissection of ligaments and neck lipocontouring enabled me (just) to get closure having revectored the mid and lower face lift in a more vertical vector. I also advanced the tragus which should give a more natural shape to the ear. 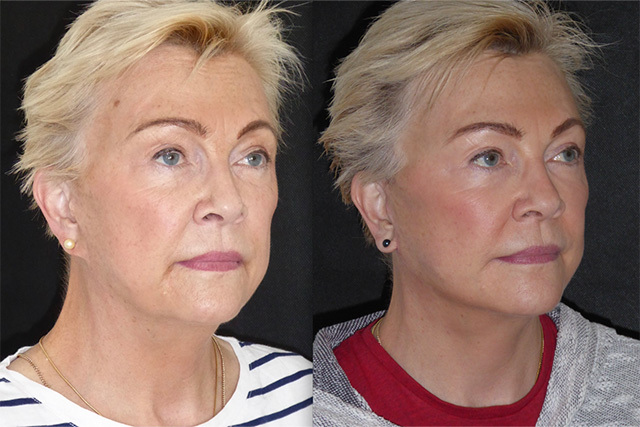 I need to watch Linda closely as I had to put a little more tension on the lateral skin than I would normally to achieve closure but overall really pleased with what we achieved. A week out and Linda is doing just great. 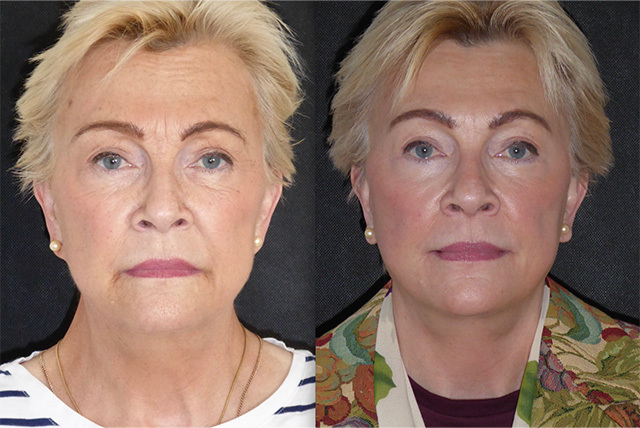 Already there is a huge improvement in the balance of her face with a youthfully revolumised middle third. 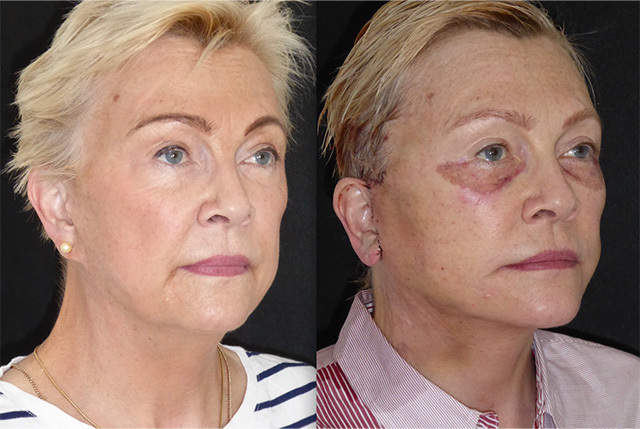 The laser crust has now come off and the eyelid skin should gradually improve over the coming months. 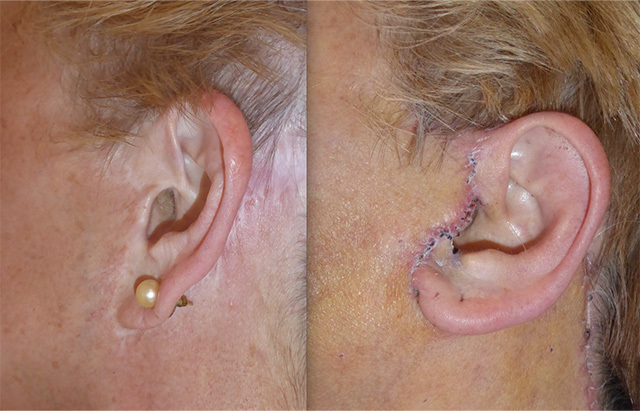 I have included photos of the incisions at this stage which show the release of tension on the tragal cartilage, the removal and resiting of the scars and release of tension within the neck muscle band. 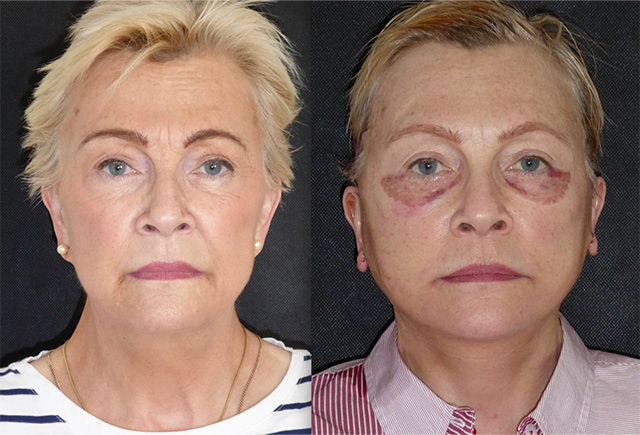 I think Linda is going to have a really lovely result in a few weeks. At just over a month, Linda is back for review and looks stunning! 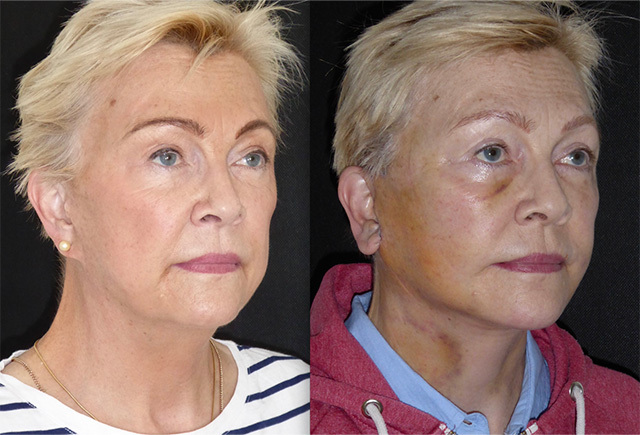 Healing really well now, her face is beautifully rejuvenated, proportionate and harmonious. Her jawline has been defined, mid face volumised and her earlobe shapes are much more natural. The change in under eye skin quality is fantastic. I am still keeping an eye on the ear incisions where I had to put a little more tension on than normal but all is healing just fine for this stage. It’s now 4 months our and Linda has healed beautifully. 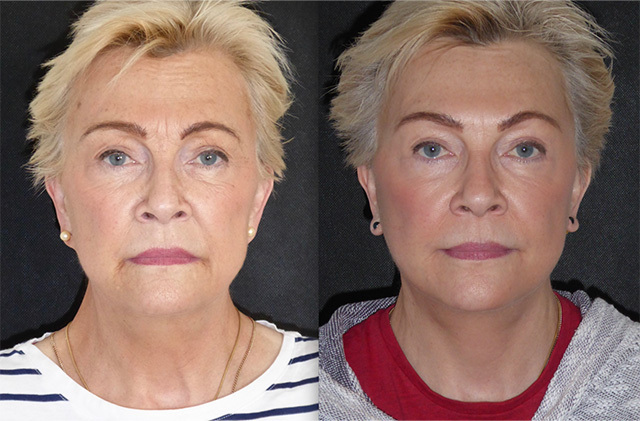 Her newly vectored and rejuvenated face suits her perfectly. She radiates beauty and confidence, her skin is improved and her eyes sparkle! 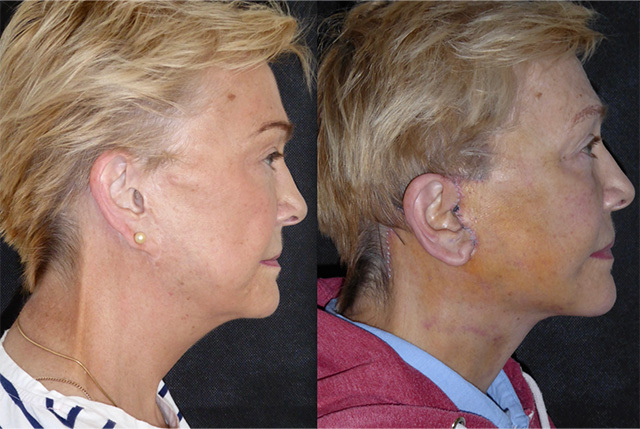 I have added a photo which shows the repair of the lateral tension on forced smile. 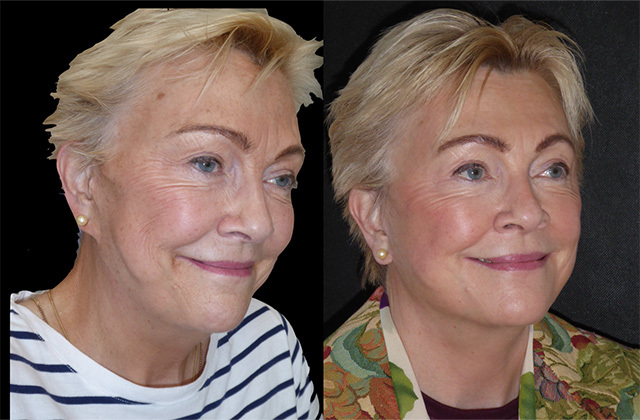 Linda’s surgery was a real challenge, one which I enjoyed and I have loved having such a lovely lady as my patient too.